This Kancheli disc is one of a series of twenty CDs freshly packaged in new slip-cases to mark Ondine�s twentieth anniversary. The originals have been selected from the company�s substantial back catalogue. Largo is clearly a favoured tempo-mood marking for Georgian composer Giya Kancheli. Both Symphonies 4 and 5 and the second movement of the First Symphony carry this marking. These are all very compact works - all shorter than 21 minutes. The First Symphony is in two movements the first of which is very angular, not particularly dissonant but characterised by discontinuity of incident - sudden protest, barking violence, whispered consolation and strutting arrogant confidence. The voices of Stravinsky and especially Shostakovich are noticeable. The Largo second movement mixes the meditative with enigmatic Ives-like moments and flashes of violence. Introspection and a whispered heart-beat finally carry the day. The Fourth and Fifth Symphonies of a sequence of seven premiered by the Georgian State Symphony Orchestra conducted by Dzhansug Kahidze during 1967-86 represent mature pre-diaspora Kancheli. The Fourth In Memoria di Michelangeli was written to mark the 500th anniversary of Michelangelo. The message is conveyed in the dominant gentle susurration of the orchestra contrasting with the protesting abrasion of the brass and bell-sonorous chaotic explosions (11:23). The still-small voice will not be silenced. This tension between peace and violence is familiar from Panufnik although in the case of that composer the contrast tends to be between whole movements rather than within movements. The coaxing consolatory message of much of this music impresses and endears. If the sprinkling of quiet percussion over the warm murmur of the strings sometimes suggests Shostakovich�s last symphony the mood is ultimately more seraphic. A phenomenal concentration is demonstrated by DePreist and the orchestra - best heard in the closing moments. The Fifth is dedicated to the memory of the composer�s parents. The juxtaposition of spleen and balm continues. Calm-imbued music is quietly reflective with the gentle notes of the harpsichord and the harp glinting over a bed of slowly moving meditative strings. This is disrupted by violent onslaughts shuddering, slamming, blasting and then dying away to leave that still-small voice again. The quiet music also carries overtones of both nostalgia and crooning consolation (9:10). The shudders and protest recall Mussorgsky�s sinister imagery supercharged with violence. The original recordings issued on Melodiya were reissued on Olympia CDs - now long gone. Those discs are very special and are well recorded. They are an authentic and exotic presence in the Kancheli discography. If you see them secondhand don�t miss the opportunity to snap them up but this Finnish recording is outstandingly good and the spirit of these works is unfiltered. The extremes, in which Kancheli is such an adept, are there in full splendour. Since the late 1980s the composer has spent more time in the West. Symphonies appear to have been left behind. Now his inspiration is gripped by a development of the meditative stream and reflected in the many Kancheli releases on the ECM label. 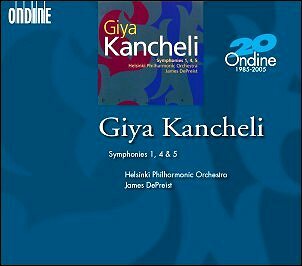 Kancheli is a fascinating character and the symphonies although seemingly abandoned for now are a fascinating presence.